Musings on Markets: The Facebook Feeding Frenzy: Time for a Pause! 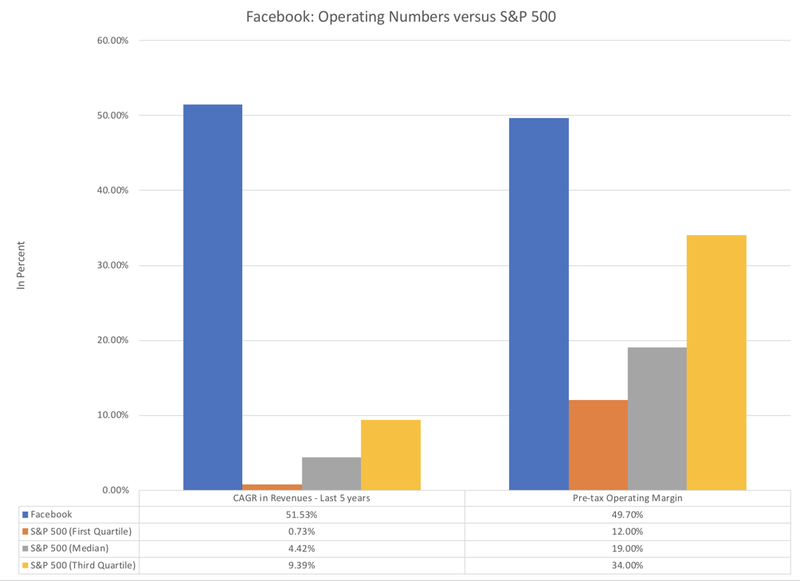 In my last post, I noted that the FANG stocks have been in the spotlight, as tech has taken a beating in the market, but it is Facebook that is at the center of the storm. It was the news story on Cambridge Analytica's misuse of Facebook user data, in mid-March of 2018, that started the ball rolling and in the days since, not only have more unpleasant details emerged about Facebook's culpability, but the rest of the world seems to have decided to unfriend Facebook. More ominously, regulators and politicians have also turned their attention to the company and that attention will be heightened, with Zuckerberg testifying in front of Congress. That is a precipitous fall from grace for a company that only a short while ago epitomized the new economy. My interest in Facebook dates back to the year before it went public, when it was already getting attention because of its giant user base and its high private company valuation. In the weeks leading up to its IPO, I valued Facebook at about $29/share, with a story built around it becoming a Google wannabe. If that sounded insulting, it was not meant to be, since having a revenue path and operating margins that mimicked the most successful tech companies in the decade prior is quite a feat. That initial public offering was among the most mismanaged in recent years and a combination of hubris and poor timing led to an offering day fiasco, where the investment bankers had to step in to support the priced. The first few months after the offering were tough ones for Facebook, with the stock dropping to $19 by September 2012, when I argued that it was time to befriend the company and buy its stock, one of the few times in my life when I have bought a stock at its absolute low. Much as I would like to tell you that I had the foresight to see Facebook's rise from 2012 through 2017 and that I held on to the stock, I did not, and I sold the stock just as it got to $50, concerned that the advertising business was not big enough to accommodate the players (Google, the social media companies and traditional advertising companies), elbowing for market share. I under estimated how much Google and Facebook would both expand the market and dominate it, but I have no regrets about selling too early. I did what I felt was right, given my assessment and investment philosophy, at the time. 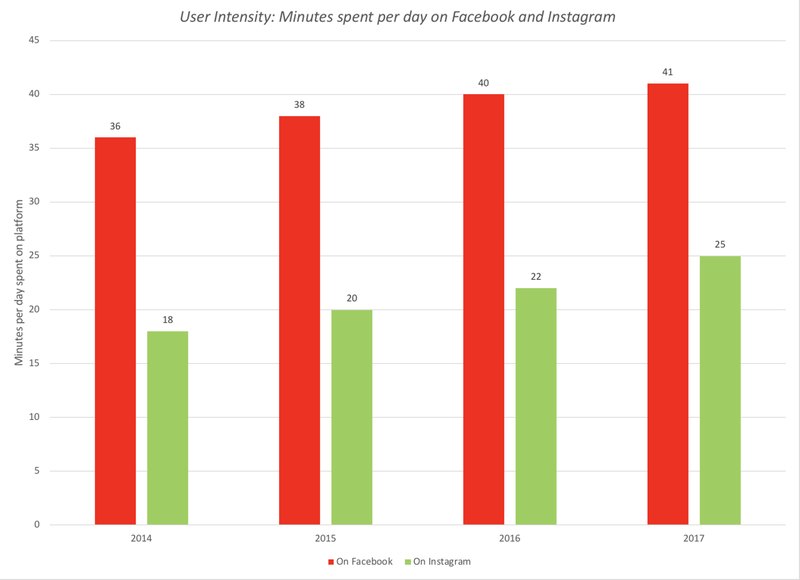 Collectively, users spent more than an hour a day on Facebook platforms, and that usage does not reflect the time spent on WhatsApp, also owned by Facebook, by its 1.5 billion users. 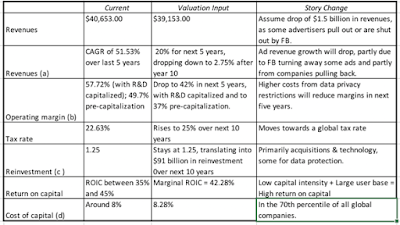 If you are a value investor, it would easy to dismiss Facebook as another user-chasing tech company and deliver a cutting remark that you cannot pay dividends with users, but Facebook is an exception. It has managed to to convert its user base into revenues and more critically, operating profits. 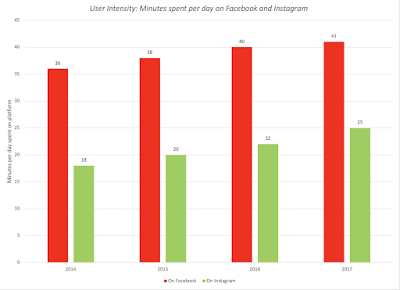 What makes Facebook's rise even more impressive is that it has been able to deliver these results in a market, where it faces an equally voracious competitor in Google. A Story Break, Twist or Change? If the Facebook story so far sounds like a fairy tale, there has to be a dark twist, and while Facebook's troubles are often traced back to the stories in mid-March 2018, when the current user scandal news cycle began, its problems have been simmering for much longer. Put on the defensive, after the 2016 US presidential elections, for being a purveyor of fake news, Facebook announced in January 2018, that it had changed its news feed to emphasize user interaction over passive consumption of public news feeds. That change, which led to a leveling off in user numbers and a loss of advertising revenues was not well received on Wall Street, with the stock price dropping almost 5%. If Facebook was trying to preempt its critics with this announcement, the Cambridge Analytica story has knocked them off stride. Specifically, a whistle blower at Cambridge Analytica claimed that the company has not only accessed detailed user data on 50 million Facebook users but had used that data to target voters in political campaigns. 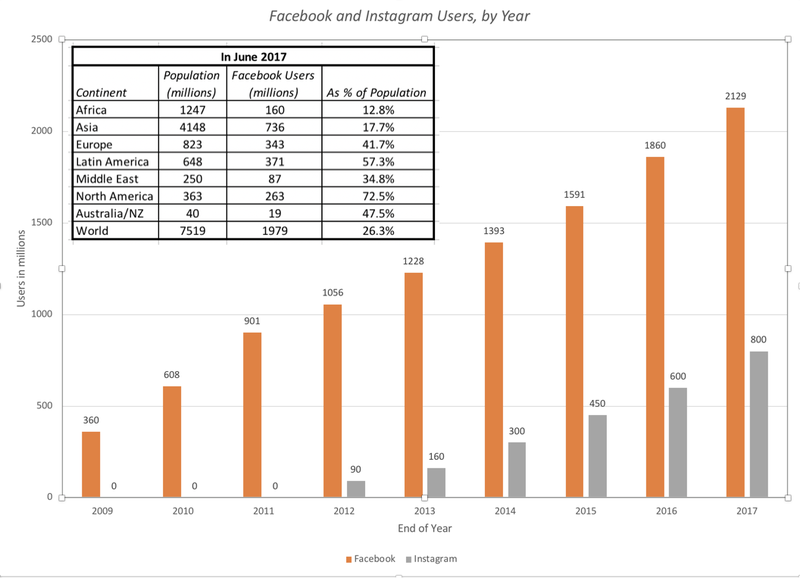 In the three weeks since, the story has worsened for Facebook both in terms of numbers (with accessed users increasing to 87 million) and culpability (with Facebook's sloppiness in protecting user data highlighted). As politicians, commentators and competitors have jumped in to exploit the breach, financial markets knocked off $81 billion from Facebook's market capitalization. 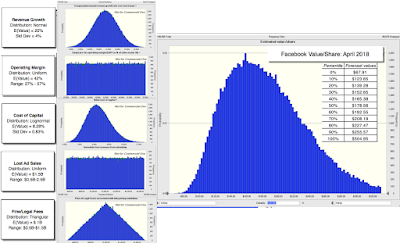 It is unquestionable that Facebook is mired in a mess and that it deserves market punishment, but from an investing perspective, the question becomes whether the loss in value is merited or not. 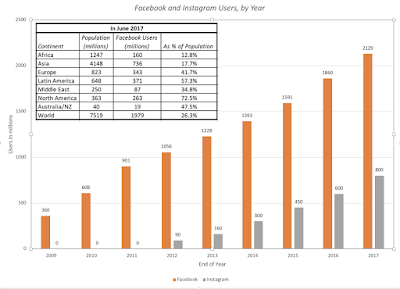 User loss, in numbers and intensity, will be muted: It is still early in this news cycle, and there may be more damaging revelations to come, but I don't believe that anything that has come out so far is egregious enough to cause large numbers of users to flee. We live in cynical times and many users will probably agree with Mark Snyder, a Facebook user whose data had been accessed by Cambridge Analytica, who is quoted as saying in this New York Times article, "If you sign up for anything and it isn’t immediately obvious how they’re making money, they’re making money off of you.” There is some preliminary evidence that can be gleaned from surveys taken right after the stories broke, which indicate that only about 8% of Facebook users are considering leaving and 19% plan significant cutbacks in usage. If this represents the high water mark, the actual damage will be smaller. 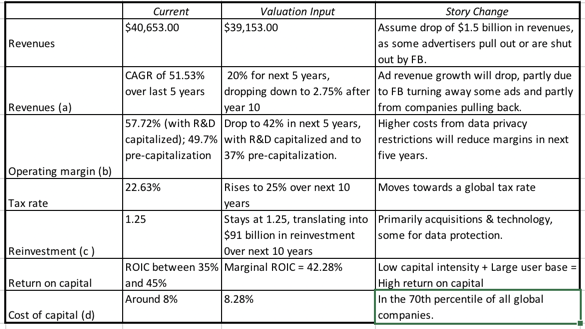 I will assume that Facebook's push towards more data protections and its larger base will slow growth in revenues down to about 20% a year, for the next 5 years, from the 51.53% growth rate over the last five years. Advertisers will mostly stay on: While a few companies, like Mozilla, Pep Boys and Commerzbank, announced that they were pulling their ads from Facebook, there is little evidence that advertisers are abandoning Facebook in droves, since much of what attracted them to Facebook (its large and intense user base and targeting) still remains in place. Facebook, in an attempt to clean up the platform, may impose restrictions on advertisers that may drive some of them away. For instance, last week, Facebook announced that it would stop accepting political advertisements from anonymous entities and I would not be surprised to see more self-imposed restrictions on advertising. I will assume that there will be more defections in the weeks ahead, mostly from companies that don't feel that their Facebook advertising is effective right now, leading to a loss in revenues of $1.5 billion next year. There will be fines: This is a wild card in this process, with the possibility that the Federal Trade Commission may impose a fines on the company for violating an agreement reached in 2011, where Facebook agreed to protect user data from unauthorized access. While no one seems to have a clear idea of how much these fines will be, other than that they will be large, there are some who believe that the fines could be as high as a billion dollars. I will assume that the FTC will use Facebook to send a signal to other companies that collect data, by fining it $1 billion. 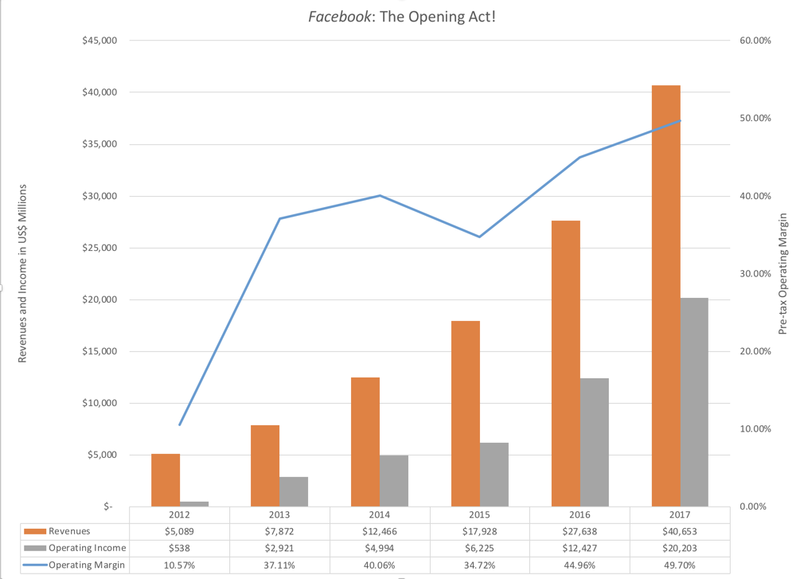 This graph reinforces my decision to invest in Facebook. 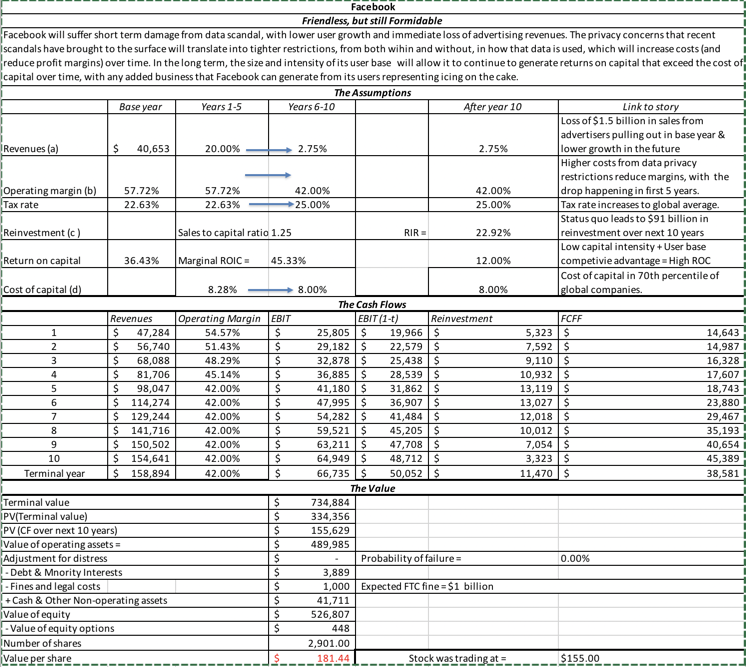 While it is true that there is a 30% chance that the stock is still over valued, there is more upside than downside potential, given my inputs. 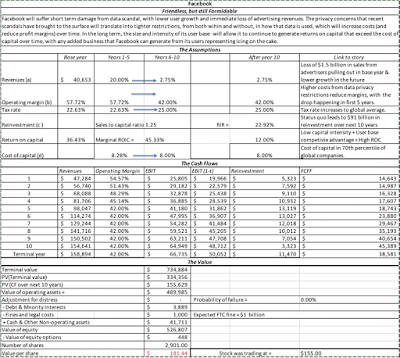 The median value of $179 is close to my point estimate value, but that should be no surprise since my distributions were centered on my base case assumptions. Every corporate scandal becomes a morality play, and the current one that revolves around Facebook is no exception. Facebook has been sloppy with user data, driven partly by greed (to keep costs down and profits up) and partly by arrogance (that its data protections were sufficient), and is and should be held accountable for its mistakes. That said, I don't see Facebook as a villain, and I don't think that the company should be used as a punching bag for our concerns about politics and society. I am sure that when Mark Zuckerberg delivers his prepared testimony in a couple of hours, senators from both parties will lecture him on Facebook's sins, blissfully blind to their hypocrisy, since I am sure that many of them have had no qualms about using social media data to target their voters. I hear friends and acquaintances wax eloquent about invasion of privacy and how data is sacred, all too often on their favorite social media platforms, while revealing details about their personal lives that would make Kim Kardashian blush. I am an inactive Facebook user, having posted only once on its platform, but to those who would tar and feather the company for its perceived sins, I will paraphrase Shakespeare, and argue that the fault for our loss of privacy is not in our social media, but in how much we share online. I will invest in Facebook, with neither shame nor apology, because I think it remains a good business that I can buy at a reasonable price. Thank you so much for doing the post. In the unlevered beta input cell, do you use an unlevered beta adjusted for cash?